BILLMARK - Pont du Crevola au pied de Simplon (Italie). BILLMARK, C.J. - Pont du Crevola au pied de Simplon (Italie). Pont du Crevola au pied de Simplon (Italie). - BILLMARK, C.J. Title : Pont du Crevola au pied de Simplon (Italie)..
Map maker : BILLMARK, C.J.. Size : 7.5 x 11.0 inches. / 19.0 x 28.0 cm. 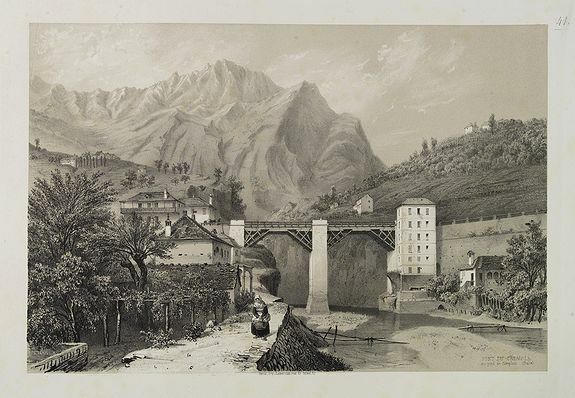 Description :Uncommon and picturesque lithography of the Crevola Bridge at the foot of the Simplon Mountain in Italy. Published by Carl Johan Billmark and printed by Lemercier in Paris, 55 rue de Seine, the leading firm in Europe at that time. From: Itinéraire Pittoresque de Stockholm à Naples? Dessinées d'après nature en lithog. Par C.J.Billmark. Sold by J.C.Hedbom in Stockholm, Quaranta in Naples and Goupil & Vibert in Paris. Billmark (along with M. G. Anckarswärd) is the greatest lithographer Sweden has ever possessed. Carl Johan Billmark arrived in Paris as a young man and lived there for most of his life, working with the best artists and craftsmen of the time. He produced several lithographic albums of high quality, some depicting European sceneries and some sceneries of his native country. He made frequent trips to Sweden to sketch originals. Billmark died during the siege of Paris in 1870. This plate is uncolored which gives an unique opportunity to study Billmark lithographic skills. Condition : Lithography on tinted ground. In mint condition.